Break the cake mold with this perfectly puffed croquembouche tower, made by Choukette éclair’art. Cream puffs are traditionally filled with vanilla pastry cream and topped with either caramel or chocolate fondant. 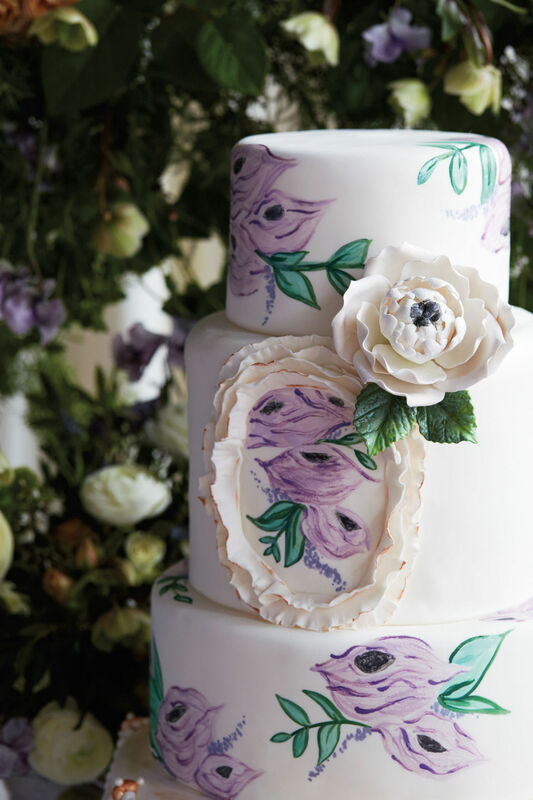 Tower layers are separated by nougatine discs and accented with ranunculus, sweet peas, tulips, and scabiosa. Linens from Choice Linens. Gold-rimmed coupes and plates, $1.50/each, Vintage Dish Company. 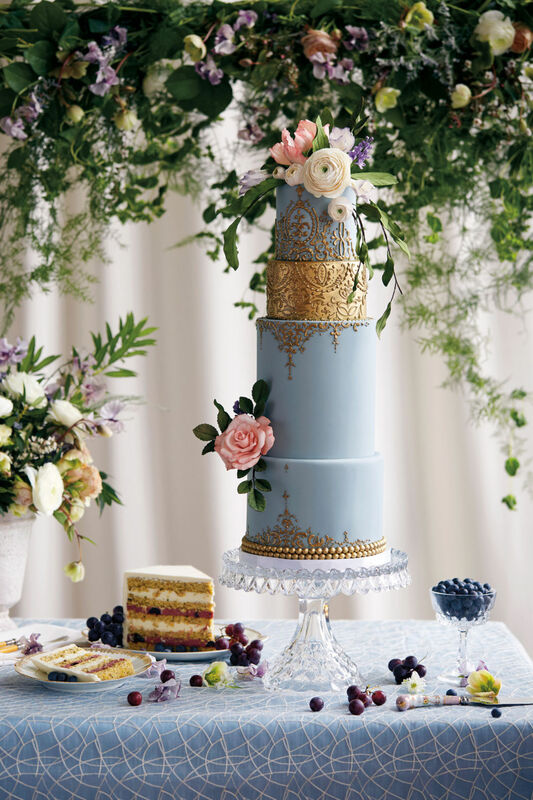 Crystal bowls, candlesticks, table runner, silver vase with purple sweet pea flowers from Valley & Co.
Channel a moody garden party with this French-style pistachio biscuit cake, decked out over four fondant tiers with intricate gold piping, roses, and ranunculus blooms, created by Midori Bakery. Slices of the pistachio cake are fortified with layers of vanilla bean white chocolate mousse and sour cherry crémeux. If vanilla and chocolate aren’t your thing, consider creating something unexpected like this magnificent tower of cheese. 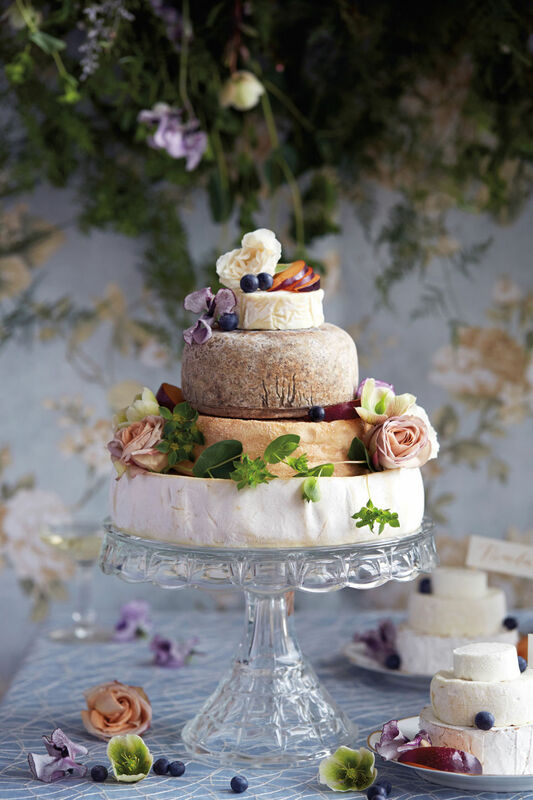 When creating a cheese stack such as this, shoot for a mix of soft and hard cheeses made from a variety of milks—sheep, goat, and cow—and adorn with live floral and edible elements. Easy accompaniments include apples, pears, stone fruit, or berries, as well as crackers, nuts, and even charcuterie. 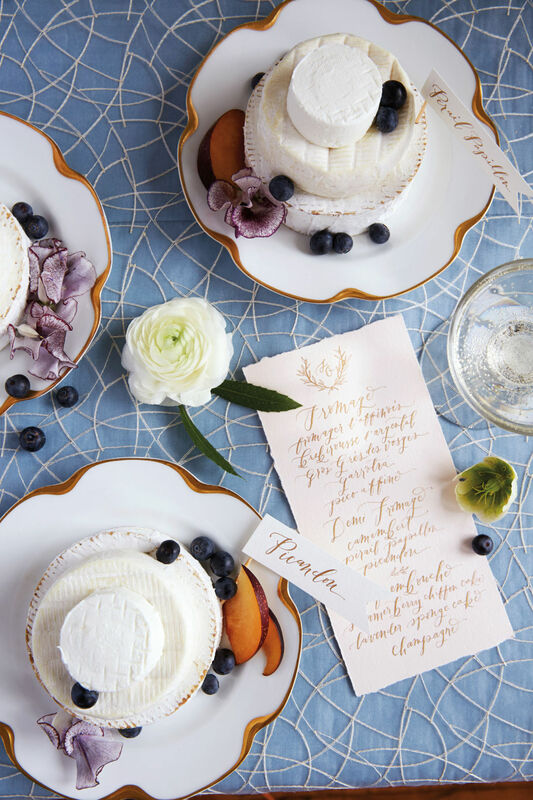 Cheeses from top to bottom: Le Pico Fromages de France Germain, San Gil d’Albió Formatge de cabra, Grès des Vosges, and Fromager D’Affinois, courtesy of Paris-Madrid Grocery, styled with roses, blueberries, hellebore, sweet peas, and plums by Valley & Co, $600 as is. Glass cake pedestal, $12 from Vintage Dish Company. 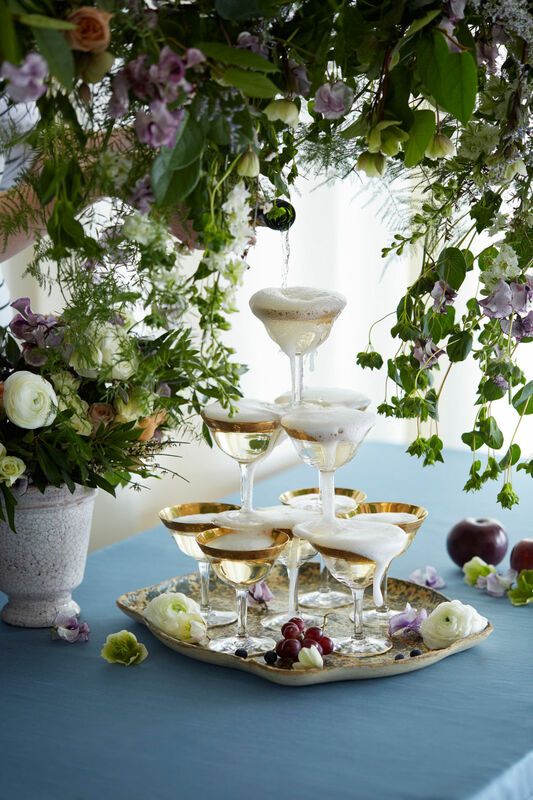 Nothing says fabulous quite like a champagne tower. The key for successfully cascading bubbles is a slow, steady hand pouring the sparkling wine, which will naturally cascade down the tower and fill the glass on the way. Gold-rimmed coupes $1.50/each, Vintage Italian papier-mâché tray, $15, both from Vintage Dish Company.